New York City, August 19, 2008, 7:30PM EST- Artist and Eyebeam alum James Powderly was detained by Chinese authorities in Beijing early Wednesday, according to a message received by Students for a Free Tibet around 5PM Beijing Standard Time, said an SFT spokesperson. The message, sent through the social networking site Twitter, read "held since 3AM", said friend and SFT board member Nathan Dorjee. Powderly has not been heard from since-more than 24 hours later-and his whereabouts remain unknown, he said. "Freedom of speech has always been central to James' practice, and we support this commitment. Most importantly, we hope for his quick release," said Eyebeam Executive Director Amanda McDonald Crowley. Powderly was a fellow in Eyebeam's R&D OpenLab in 2005-2006, and a senior fellow in the OpenLab from 2006-2007. Powderly is also co-founder of the Graffiti Research Lab, a project developed during his fellowship at Eyebeam. He was in Beijing collaborating with the activists to project messages onto the facades of prominent Beijing buildings using a laser beam and stencils. The artist was detained before the planned launch of the project-dubbed the "Green Chinese Lantern"-in which a beam of light would be used to display graphics and text on structures up to two stories high, said Dorjee. It is unclear how Chinese authorities learned of the plan. Also today, five activists with Students for a Free Tibet were detained after displaying a banner that spelled out "Free Tibet" in LED Throwies, the open source technology pioneered by the Graffiti Research Lab and popularized online and worldwide. This brings the number of SFT protestors detained in Beijing to 42. In the majority of these cases, the individuals were heard from and deported within 6-12 hours of their arrest, said Dorjee. Upon learning of the detention, fellow artist, collaborator, and current Eyebeam senior fellow Steve Lambert said, "He's an amazing, entertaining, brilliant, and committed person. Not all of us have the courage to travel to China to make such a statement at a key time like this. He's a great friend and obviously, like so many others, I'm concerned about his well-being. I hope he's allowed to return home as soon as possible." The L.A.S.E.R. Stencil technology is a modification of the GRL's L.A.S.E.R. Tag, which was featured in the 2007 Eyebeam exhibition Open City. This portable, updated version is the size of a flashlight, requires one person to operate, and is intended for use with homemade micro-stencils. Students for a Free Tibet, a group with more than 700 chapters worldwide, has been staging protests in Beijing over the course of the past two weeks. According to Dorjee, who is also the group's technical advisor, GRL technology was an ideal fit for the spectacle of the Olympics, and called the GRL the "go-to group for open source urban expression". Submitted by Steven Kaplan on Sat, 2008-08-23 11:51. Powderly’s work still managed to be seen in Beijing, albeit on much smaller (and briefer) scale. 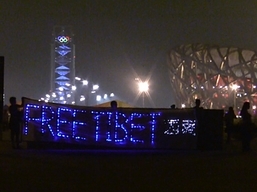 Last night, a group of five activists affiliated with Students for a Free Tibet used one of Powderly’s inventions, LED “throwies” to spell out FREE TIBET in English and Chinese in Beijing’s Olympic Park. The five were detained by security personnel after displaying the banner for about twenty seconds. Submitted by Steven Kaplan on Fri, 2008-08-22 22:57. Lacoste Index? or McCommunism, courtesy of Police State 2.0? Submitted by Steven Kaplan on Sat, 2008-08-23 16:59. Has the PRC, using the Olympics as a cover, become Police State 2.0, a proving ground for a worldwide corporate hegemony of surveillance and control? "The goal of all this central planning and spying is not to celebrate the glories of Communism, regardless of what China's governing party calls itself. It is to create the ultimate consumer cocoon for Visa cards, Adidas sneakers, China Mobile cell phones, McDonald's happy meals, Tsingtao beer, and UPS delivery -- to name just a few of the official Olympic sponsors." "Chinese corporations financed by U.S. hedge funds, as well as some of American's most powerful corporations -- Cisco, General Electric, Honeywell, Google -- have been working hand in glove with the Chinese government to make this moment possible." "But how much is really needed to secure a sporting event? The price tag has been put at a staggering $12-billion -- to put that in perspective, Salt Lake City, which hosted the Winter Olympics just five months after September 11, spent $315 million to secure the games. Athens spent around $1.5-billion in 2004." ""By next year, the Chinese internal security market is set to be worth $33-billion." "There is a bitter irony here. When Beijing was awarded the games seven years ago, the theory was that international scrutiny would force China's government to grant more rights and freedom to its people. Instead, the Olympics have opened up a backdoor for the regime to massively upgrade its systems of population control and repression. And remember when Western companies used to claim that by doing business in China, they were actually spreading freedom and democracy? We are now seeing the reverse: investment in surveillance and censorship gear is helping Beijing to actively repress a new generation of activists before it has the chance to network into a mass movement." Murph: Let's step away from Tibet just for a moment, since you might find it too trendy, an issue too readily embraced by privileged latter day hippies and trustafarians. How about freedom of speech? Do you find that "a bit suspect" in an "art linkage"? At what point will "righteous indignation", however uncool when viewed from behind the sales counter, be an appropriate response to surveillance, censorship, detention and other corporate/government strategies of centralized, authoritarian control? Submitted by murphy on Sun, 2008-08-24 14:23. Reading the bios of the five SFT members arrested and deported on nettime I felt as though I'd stumbled into some lost Doris Lessing novel where disenfranchised characters use activism as their own personal therapy then get caught up in the reality of their situations. Powderly doesn't seem the type for that and I hope he's all right, I haven't heard any further details of his situation. He seems to have, with all good intentions, allowed himself to be the fall guy. China is one big sales counter these days and we all know how commerce trumps any kind of free speech. I wouldn't be surprised if the Chinese government is relieved all the attention is focused on the Free Tibet movement, diverting attention from their other, less glamorous problem areas that don't have the charisma of the Dalai Lama to front for them. Klein is right, of course, she usually is, and nearly as charismatic as the Dalai Lama. Tibet is the kind of mini-disaster China can use to their economic advantage. Why in the world would they give up Tibet? Even the Dalai Lama has said this is a lost cause. So, to me, it's an example of wasted breathe (or light beams, in this case). Why not go after the real culprits: McDonalds, et al? Agreed. Tibet is a diversion from the larger issue. Submitted by Steven Kaplan on Sun, 2008-08-24 22:05. An estimated 130 million Chinese are now migrant laborers in their own country. This is one tenth of the population. They have been left behind by McCommunism, dispossessed from homes and villages that are now free economic zones or hydroelectric dams or even the Olympic Park in Beijing. They are an army of the disenfranchised, many homeless, subsisting on the outskirts of Shenzhen, Shanghai and other cities. This dislocated proletariat is a national scandal, larger than the ethnic injustices perpetrated in Tibet. They pose a continuing security threat to the central government. So yes, the PRC leadership does not mind a foreign lunatic fringe that screams "Free Tibet!". It not only sidetracks the larger problem, it rallies the ethnic Chinese behind their government in the name of national pride. As far as charisma, Klein has it, the Dalai Lama has it, Mao has it, I might have it, and so might you, diffenbacchia. Nice leaves. Submitted by murphy on Tue, 2008-08-26 23:41. The one aspect of the "free Tibet" movement that bothers me the most is the technocratic tendency to treat "Tibet" as software and believe that it should be "free" (as in free speech, not free beer). That is the reason GRL is involved and, more and more, the rhetoric coming out of the detention and deportation of Powderly. Granted, this is an interesting art proposition, but not very helpful to the people of Tibet. However I believe the aim of GRL is technocracy, not art, as is the driving force behind Eyebeam and most new media art. It's something I've harped on for the past ten years and will continue to do so, but not here. Seghal is an insteresting take on this, as is the "Nikeplatz" project of a few years ago. The provide an alternative to the GRL/Eyebeam technocratic aesthetic. proclaimed the supremacy of religious truth." Thank you for noticing my leaves. I'm quite proud of them. 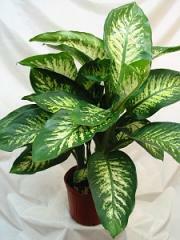 I do want to ask what leave polish you use on your foliage? Submitted by Steven Kaplan on Wed, 2008-08-27 03:02. Utter the sacred words or perform the ancient rites and the Holy Spirit can never fail but enter into you. Or into your parishioners. Is that it? We seem to be approaching the realm of magic and incantation. In the beginning there was the word, and the word was ... Abracadabra? Open Sesame? The primacy of utterance is a featured part of the Charismatic Movement, which favors the speaking in tongues. "In the charismatic movement speaking in tongues, glossolalia, occupies a significant place. Speaking in tongues is generally understood to be communication with God in language that is other than one known to the speaker. A person does the speaking, that is, he freely uses his vocal apparatus, but it is claimed that the Holy Spirit gives the utterance. It is viewed as transcendent speech by the enabling of the Holy Spirit." "The essential charismatic claim about glossolalia is that this is the vehicle of communication par excellence between man and God. It is the language of transcendent prayer and praise. In tongues there is speech to God which goes beyond the mental into the spiritual. Charismatics frequently state that in tongues there is a fulfillment of the intense desire to offer total praise to God not only with the mind but also with the heart and spirit." Submitted by Steven Kaplan on Wed, 2008-08-27 10:32. Submitted by Steven Kaplan on Sat, 2008-08-23 17:25.